This week on Moms on Mondays I am proud to feature Tiffany and Jacob from Camp Light Apparel! They are just the cutest and their tees are super soft, comfy and contribute towards a great cause. Check out their post below and then go shop! Lemon loves her Dreamz Really Do Come True shirt! Our shop is CampLight Apparel and we are also on Instagram, Facebook, Twitter and Pinterest. 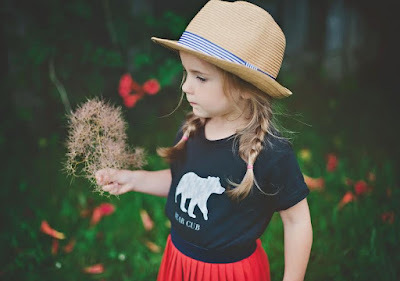 We design children's tees that focus on the simplicity and joy of childhood. We also currently sell a children's hat, as well as a couple tees in adult sizes. 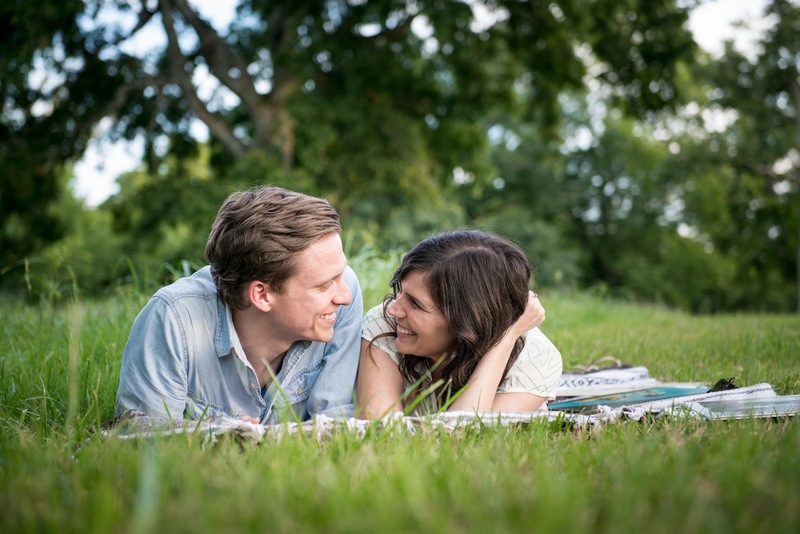 We'd thought for a while about taking on a creative venture together, as a husband and wife team. At the same time, we had a desire to help others in need, and thought this would be a great way to fulfill both dreams. Every shirt sold helps provide school uniforms for children in need. We opened in April of this year. I have a background in sales, and my husband, Jacob, has a degree in graphic design and works in that field. We are a family of four--we have a son and a daughter--and we love traveling together and trying new restaurants we see on The Food Network. We love serving other people as a family when possible. It's been a lot of fun working together as a husband and wife team. Jacob and I really enjoy designing the shirts together and dreaming about what else we can create! It also feels really good to have a tangible way to give to others, whether it be for school uniforms or other needs. For instance, we have some friends in the middle of a long adoption process. They've had to move their lives to Uganda, and it has been a very challenging time for them as they wait for their adoption to finalize. 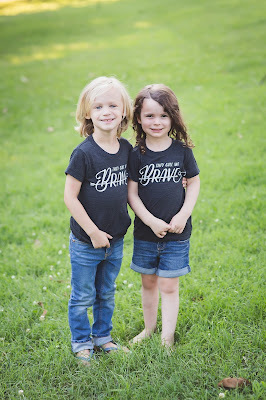 We've been really inspired by their story and wanted to help them out since they're financially strapped by medical bills, adoption expenses, and living expenses in two countries. We designed a shirt--"They Call Me Brave"--specifically to help with their adoption, and 50% of proceeds from that shirt are going to them. We're hoping to design more shirts like this in the future to help other needs, and it's meant a lot to me to be able to do things like this. I've dreamed of designing children's clothing for years, but I wasn't sure when I'd get the opportunity to do so. I'm so happy my dream became a reality! In house, we're just a husband and wife duo. However, we have to give a huge shout out to all of our brand reps, brand enthusiasts, and brand ambassadors. They've been a huge support from day one! I just recently quit my job and am focusing on this full time. I really enjoy what I do, so it doesn't feel like work most of the time. Everything--dreaming, creating, and helping others in need. I especially love sitting next to my husband with a cup of coffee while we design a shirt together. Getting your name out there when you're just starting can take a little time. We'd like to see it grow and have meaning and a purpose behind it. We hope in some way that our tees can tell a positive story in the lives of others. Our "New Heights" design. Partially because it was our first, and also because we love mountain scenery and adventure. I'm really happy with how much we communicated with such a simple design. Be ok with learning as you go. 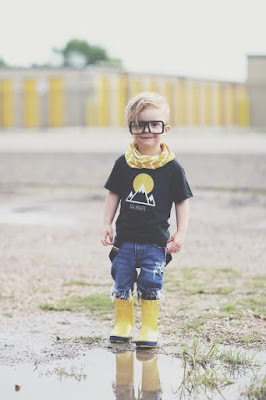 We started CampLight Apparel with a desire to make children's clothes, but there were a lot of things we didn't know at the beginning. We've learned so much during this process, and have had to make some adjustments along the way, but that's part of the adventure of starting something new. It's been fun to gain new knowledge and to continue to learn how to run CampLight Apparel in the best way possible. Freckle Baby - They make cool, color-block bibs with a snap for attaching toys and pacifiers. Ryan & Rose - We love their cutie clips! 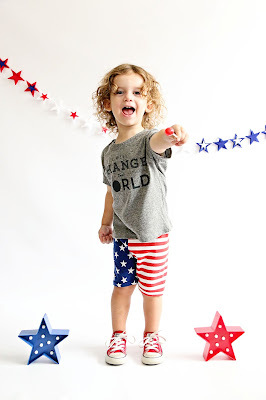 Ragamuffin Threads - The best leggings. Thank you Tiffany and Jacob, we love your shop and your purpose for creating! Wishing you all the best!